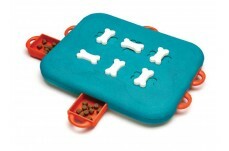 NO REMOVABLE PARTS: This dog game has built in play pieces that don�t come out when your dog plays with it. TWIST IT: Unique to the Nina Ottosson Dog Casino dog game are the locking bone pieces. If your dog is good at solving puzzles, introduce them to a new challenge by simply twisting the bones on top to lock the drawers. LEVEL 3 CHALLENGE: Nina Ottosson Dog Games and puzzles are great for dogs of all ages, breeds and sizes. This level 3 dog game is especially recommended for more challenging play, but can be used with dogs of all play levels. HOW TO PLAY: With bones in unlocked position, open drawers and drop in treats or kibble. Close drawers and lock bones. Let the games begin! Place the game on the floor and encourage your pet to seek treats. Dogs are smarter than you think. Sometimes we just need to teach them! 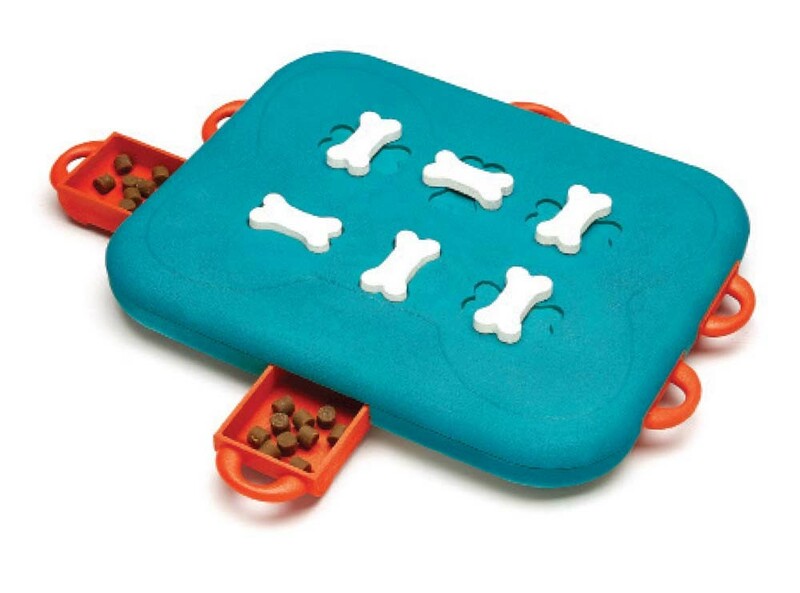 Leave bones unlocked and a drawer or two open to gain your dog�s interest. FROZEN PUZZLE: Mix some canned/wet dog food or raw food with water, pour some of the mixture in the hollows, or place a small piece of sausage or a tasty treat in each of the hollows, pour a little water, put the game in the freezer and let it set. Perfect for energetic dogs, hot weather, or just extended fun. PLAY TOGETHER: Nina Ottosson Dog Puzzle Games focus on challenging your dog�s brain. Supervise when playing, and don�t let the dog chew on the toy. Teach your dog how to use the puzzle, play and have fun together. Put away until next time. EASY TO CLEAN: To wash your dog�s Dog Casino, simply remove all treats/kibble and hand wash with warm soapy water, rinse clean and dry. Fill again for more fun!